At first listen, I was little unenthusiastic about the Mirah record, but maybe that’s because I’m not so familiar with her music. There’s one thing I’ll tell you though, it’s not easy to find official info on the web about Mirah. The new record comes out August 7th, she’s probably gonna tour behind it, and a little birdy told me she might be playing a club in Brooklyn that I frequent. Oh yeah, for all my fruitless searching, I was able to find a nice profile on the new Mirah album over at Obscure Sound. 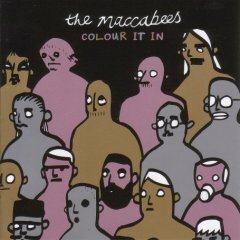 The Maccabees record sounded alright (from what I’ve heard so far), a little bit like Bloc Party meets The Strokes (which is not a bad thing in my opinion). I’m just not sure that they are distinctive enough to stand out in the tidal wave of British bands that lands on us every week or two. The Maccabees are touring now, they are playing the Knit this week; check the list below for a date near you.